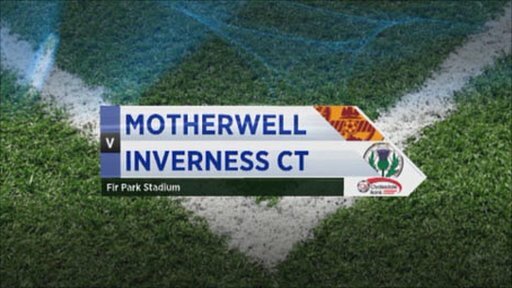 Motherwell began their Scottish Premier League campaign with a comfortable victory over Inverness Caley Thistle. Steven Hammell volleyed the Steelmen in front on 25 minutes and Jamie Murphy soon doubled the hosts' advantage with a cool finish. Inverness twice hit the frame of the Well goal in the first half, with Richie Foran and Greg Tansey foiled. And Motherwell rounded off their win with an excellent Keith Lasley strike on 77 minutes. Murphy, understood to be the interest of Tottenham, Wolves, Stoke, West Brom and Birmingham scouts in the stand, was first to threaten after playing a one-two with Michael Higdon and slipping a shot wide. Higdon's physical presence was proving to be a nuisance to Inverness and the big striker set up fellow summer signing Nicky Law for a shot, but the midfielder was off target. The visitors came into the match and, after Gregory Tade fired over, Richie Foran struck the base of the Motherwell post from the edge of the box. Tade then set up Foran for a shot that he could not keep down. Stuart McCall's side regained the initiative and Chris Humphrey's cross was flicked on by Higdon to Hammell, who fired home with the aid of a post. Murphy stretched Motherwell's lead after latching on to Law's incisive pass and slotting the ball past goalkeeper Ryan Esson. The Highlanders searched for a route back into the match and Tansey's free-kick rattled Darren Randolph's goal before the midfielder was denied by the Motherwell keeper. The second period was a more sedate affair, Law's shot over the top of the Inverness goal one of the few chances created. Inverness defender Tom Aldred headed wide after venturing forward for a free kick and Shane Sutherland's volley from inside the Motherwell box was too high. Murphy's pace and trickery continued to be a thorn in the visitors' side and the Scotland Under-21 international flashed a shot wide after tormenting Aldred. However, it was from the boot of experienced midfielder Lasley that Motherwell put the seal on their win, the former Plymouth player finding the top left-hand corner from 30 yards. 90:00+2:13 The referee ends the match. 89:57 Short corner taken by Tom Hateley. Short corner taken by Tom Hateley. 82:33 Long range shot by Jonathan Hayes goes wide right of the net. 82:33 Substitution Gary Smith is brought on as a substitute for Michael Higdon. 80:02 Substitution Graeme Shinnie on for Gregory Tade. 79:10 Free kick awarded for a foul by Nicky Law on Gregory Tade. Free kick taken by Jonathan Hayes. 78:47 Short corner worked by Nicky Law. 77:51 Kenny Gillet concedes a free kick for a foul on Jamie Murphy. Direct free kick taken by Stevie Hammell. 76:22 GOAL - Keith Lasley:Motherwell 3 - 0 Inverness CT A goal is scored by Keith Lasley from 30 yards to the top left corner of the goal. Motherwell 3-0 Inverness CT.
75:47 Tom Hateley takes a outswinging corner. 74:23 Jonathan Hayes takes a inswinging corner to the near post, clearance made by Tom Hateley. Inswinging corner taken by Jonathan Hayes, Shaun Hutchinson manages to make a clearance. Short corner taken by Richie Foran. 73:16 Effort from inside the area by Jamie Murphy misses to the left of the target. 71:48 Darren Randolph takes the free kick. 71:48 Booking Richie Foran is booked. 71:40 Richie Foran challenges Stephen Craigan unfairly and gives away a free kick. 70:41 Effort on goal by Shane Sutherland from just inside the penalty area goes over the target. 70:13 Jamie Murphy gives away a free kick for an unfair challenge on Shane Sutherland. Jonathan Hayes takes the direct free kick. 68:35 Headed effort from inside the area by Tom Aldred misses to the left of the target. 67:59 Kenny Gillet takes the direct free kick. 67:59 Booking Steve Jennings is given a yellow card. 67:33 Free kick awarded for an unfair challenge on Jonathan Hayes by Steve Jennings. 65:06 David Proctor fouled by Michael Higdon, the ref awards a free kick. Ross Tokely takes the direct free kick. 63:48 Nicky Law is adjudged to have handled the ball. Ryan Esson takes the free kick. 61:03 Substitution Shane Sutherland replaces Andrew Shinnie. 58:25 Kenny Gillet concedes a free kick for a foul on Chris Humphrey. Direct free kick taken by Tom Hateley. 56:54 Free kick taken by Ross Tokely. 56:54 Booking Keith Lasley is shown a yellow card. 56:44 Free kick awarded for a foul by Keith Lasley on Greg Tansey. 55:11 The ball is sent over by Jonathan Hayes, Header by Richie Foran from deep inside the penalty area misses to the left of the goal. 50:10 Free kick taken by Greg Tansey. Outswinging corner taken by Andrew Shinnie, clearance by Shaun Hutchinson. 50:10 Booking Shaun Hutchinson shown a yellow card. 50:04 Shaun Hutchinson concedes a free kick for a foul on Gregory Tade. 47:06 Shot from just outside the area by Nicky Law goes over the bar. 46:29 Steve Jennings fouled by Tom Aldred, the ref awards a free kick. Darren Randolph takes the direct free kick. 45:57 Shaun Hutchinson gives away a free kick for an unfair challenge on Richie Foran. Free kick taken by Tom Aldred. 45:31 Nicky Law takes a shot. Save made by Ryan Esson. Keith Lasley is caught offside. Ryan Esson restarts play with the free kick. 45:00+1:08 The referee calls an end to the first half. 45:00+0:29 The assistant referee flags for offside against Gregory Tade. Darren Randolph restarts play with the free kick. 44:57 Steve Jennings gives away a free kick for an unfair challenge on Nick Ross. Free kick taken by Ross Tokely. 44:14 Stevie Hammell has an effort at goal. Save by Ryan Esson. 43:23 Unfair challenge on Steve Jennings by Greg Tansey results in a free kick. Tom Hateley takes the free kick. 42:21 Shot by Steve Jennings from 20 yards. Jonathan Hayes gets a block in. 41:24 Greg Tansey has a volleyed shot. Darren Randolph makes a save. Greg Tansey takes a shot. Comfortable save by Darren Randolph. 39:28 Richie Foran fouled by Stephen Craigan, the ref awards a free kick. Strike comes in from Greg Tansey from the free kick. 36:42 Unfair challenge on Shaun Hutchinson by Gregory Tade results in a free kick. Direct free kick taken by Darren Randolph. 35:59 Free kick awarded for a foul by Michael Higdon on Richie Foran. Ryan Esson restarts play with the free kick. 35:46 David Proctor gives away a free kick for an unfair challenge on Nicky Law. Stevie Hammell takes the direct free kick. 32:47 Chris Humphrey crosses the ball, Michael Higdon takes a shot. Comfortable save by Ryan Esson. 29:58 Andrew Shinnie has a headed effort at goal from deep inside the area missing to the left of the target. 29:08 Free kick awarded for a foul by Michael Higdon on Ross Tokely. Ryan Esson takes the direct free kick. 27:31 The assist for the goal came from Nicky Law. 27:31 GOAL - Jamie Murphy:Motherwell 2 - 0 Inverness CT Jamie Murphy fires in a goal from inside the box to the bottom right corner of the goal. Motherwell 2-0 Inverness CT.
24:25 The assist for the goal came from Michael Higdon. 24:25 GOAL - Stevie Hammell:Motherwell 1 - 0 Inverness CT Stevie Hammell finds the net with a goal from deep inside the penalty box to the top left corner of the goal. Motherwell 1-0 Inverness CT.
23:29 Nick Ross gives away a free kick for an unfair challenge on Stevie Hammell. Free kick taken by Stevie Hammell. 21:39 Richie Foran produces a left-footed shot from inside the area that clears the bar. 20:02 Unfair challenge on Jamie Murphy by Andrew Shinnie results in a free kick. Direct free kick taken by Keith Lasley. 17:22 Richie Foran produces a drilled left-footed shot from just outside the box that bounces off the post. Short corner taken by Jonathan Hayes. Corner taken by Jonathan Hayes played to the near post, Stevie Hammell manages to make a clearance. Free kick awarded for a foul by Greg Tansey on Nicky Law. Darren Randolph takes the direct free kick. Correction - 15:13 Free kick awarded for an unfair challenge on Tom Hateley by Greg Tansey. Free kick crossed left-footed by Stevie Hammell. 15:13 Greg Tansey gives away a free kick for an unfair challenge on Tom Hateley. The free kick is swung in left-footed by Stevie Hammell. 12:18 Effort from inside the area by Nicky Law misses to the right of the goal. 11:42 Effort on goal by Gregory Tade from deep inside the area goes harmlessly over the bar. 10:42 Foul by Michael Higdon on Tom Aldred, free kick awarded. Ryan Esson takes the free kick. 10:02 The official flags Michael Higdon offside. Tom Aldred takes the indirect free kick. The official flags Richie Foran offside. Indirect free kick taken by Darren Randolph. 6:45 Corner taken by Tom Hateley played to the near post, Richie Foran manages to make a clearance. 4:00 Tom Hateley has an effort at goal. Ryan Esson makes a comfortable save. 1:48 Jamie Murphy has an effort at goal from just inside the box that misses to the right of the target. 0:14 Free kick awarded for an unfair challenge on Stephen Craigan by Gregory Tade. Darren Randolph takes the free kick.